Dot Net Authorities : Recipe4.2.2:(Intranet Security) TransportWithMessageCredential Security with UserName authen. Recipe4.2.2:(Intranet Security) TransportWithMessageCredential Security with UserName authen. · TransportWithMessageCredential uses means message protection(Integrity, confidentiality) is provided at Transport level but client authentication is done at Message-level. a) UserName authentication with all validators (Windows, Membership and custom). b) Windows authentication both NTLM/Kerberos. · This Recipe4.2.1, uses UserName authentication with Windows Validator and UseWindowsGroups (or UseAspNetRoles ) Validator for authorization. Windows Validator against AD/WG clients. By SSL certificate Validating at client-side. Step 1: Enable SSL and configure IIS / Virtual directory. · SSL requires certificate to be location=localMachine and store=My (i.e, Personal). · RootCA is nothing but a Certificate Authority that identifies all its issued certificates. Step1.1: Create & install SSL certificate at respective location. 1: Create self-signed Root CA with private key. Add Standalone Snap-inè CertificatesèAdd èComputer Account (available to all users). 3: Create and install self-signed certificate for SSL as issued certificate. Step1.2: Enable SSL over IIS. Edit è Check in Enable Anonymous Access. · For username authentication against Windows clients, WCF provides predefined validator called Windows UserNamePasswordValidator. a) System.Web.Security.WindowsTokenRoleProvider / AuthorizationStoreRoleProvider for WorkGroup / ActiveDirectory Data Source respectively for role management. b) System.Web.Security.SqlRoleProvider if you want to work with SQL data source by explicitly assign roles in db. Note: Copy these settings form Machine.config.comments then paste and edit it. Step-(b1): Create and Assign Roles to Windows Accounts. Sdkcmd> aspnet_regsql –S .\SQLExpress –E –A r // - A r: Add only role-provider features; -E: Integrated Security. Execute sp aspnet_CreateRole ‘MyApplicationName’, ‘Managers’ // name should be as in Providers. Step5: Configure the Service behavior to use Validators for authentication and authorization. · Solution explorer èRight Click è Add new Website è”WCFTestClient”. · Add service reference; https:// homepc-9c7a749d/TransportWithMessageSecurity/; instead localhost use server name. (2) No need of configuring as it is required only for Message level security not for Transport security. Rebuild Service and execute host application. Execute client application. Ø UserName authentication with all validators (Windows, Membership and custom). Ø Windows authentication both NTLM/Kerberos. · This variation Recipe is same as Recipe 4.3.1, but uses wsHttpBinding instead of basicHttpBinding. 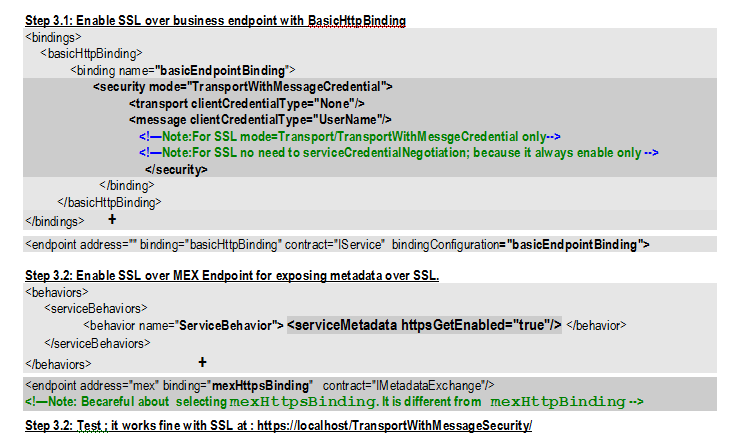 · wsHttpbinding needs some additional requirements when working with TransportWithMessageCredential / Transport security. 1) You must have to configure http port with ssl certificate. Note: These are 2 additional configurations are not required when binding is either basicHttpBinding / netTcpBinding. Step 1: Configure http port with ssl certificate. § Open Personal certificate folder è Open installed ssl certificate. § Use utility httpcfg.exe (for Win2k3/Xp) / netsh.exe (vista/Win2k8). § These utilities are available as ServicePack support tools; and needs to be download explicitly. (a) To bind SSL certificate to a HTTP port number. (b) To view/determine bind certificate when HTTP port. Note: To generate appid ( VS èTools ècreate GUID èSelect registry format è Copy èExit. Step 2: Change binding(basicHttpBindingèWsHttpBinding) at and elements.